Hands-on with Ableton Live 9: Push... And the rest! We round off our week-long investigation of Ableton Live 9's features with a look at Ableton's hardware debut Push and a look at a few more of the DAW's new features. Computer Music sat down with the public beta version of Live 9 earlier this year, and what you read here are the things they learned from several days of exploring every nook and cranny of this major update. A different kind of DAW deserves a different kind of controller, and Push could well be just it - in fact, Ableton go a step further and refer to it as an instrument. Designed entirely by Ableton and manufactured by Akai, Push is a hardware device with a multicoloured grid matrix of pads, some rotary controller knobs and numerous function buttons. Nothing new there, you might say, and you'd be right: Push can be used as a traditional controller. But that's not the clever part - the clever part is in the way it's used to play music. Traditional controllers have leaned towards live playback and manipulation of existing material, but Push is very much a compositional or musical performance tool. It's designed to facilitate the easy composition of sophisticated music: simply set a scale and play. The layout is such that patterns and scales are always played using the same patterns, no matter where your hand is, unlike, say, a piano. You can even set it to automatically remove notes that aren't in the scale. A total novice could play chords and in-key melodies with just minutes of acclimatisation. 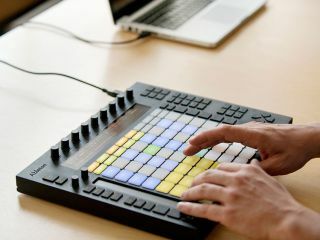 We did get our hands on Push at Ableton HQ a while ago, but we haven't spent enough time with it to bring you an authoritative opinion as yet. Suffice to say, the build quality is splendid, and at first push, it does seem to live up to Ableton's hype. It's up for pre-order next week and will set you back $599. As well as all that headline stuff, Live 9 boasts an extensive list of 'lesser' improvements. Not least of these is an enhanced key command set for things like Draw mode and various navigation functions. It doesn't matter how great your interface is to click around, key commands for your most repeated functions saves time and helps you make music faster, so any enhancement in this area is most welcome. The sound library, too, has been expanded, with new offerings from a range of producers in different genres, and, reflecting Live's increasing pro user demographic, a lot of content aimed at film, ad, game and TV scorers - more world and orchestral sounds, for example. 9 Ableton have added Max for Live to Suite, which comes with 25 brand new Max for Live MIDI/audio effects/instruments. Some are based on previously available devices but all have been worked up for Live 9. One of our favourites is Buffer Shuffler, which offers a cool, matrix-based way to tweak your audio's pitch, gating, panning and a variety of other parameters. It even has a wet/dry control for the creation of awesome resonant techno sounds. Another good example is Mono Sequencer, which brings the joy of TB-303-style step sequencing to any instrument in your arsenal. And speaking of instruments, there are a large range of drum synths included, a great example of which is FM2, delivering musical FM percussion. For those who don't know, there are two reasons to love Max For Live. Based on Cycling '74s acclaimed Max, Max For Live offers those of a technical, programming bent a limitless construction platform on which to construct everything from MIDI step sequencers and touch-screen control interfaces to custom synths and effects. In a similar way to Native Instruments' Reaktor, it gives users the freedom to make the effects they want, how they want, and then, in the service of community, ego or entrepreneurial spirit, share their creations with the rest of the world. And that's the second reason to have Max For Live in your life - you'll never tire of the fruits of other people's creativity (you can always take a look behind the scenes to see how a device works.) We suspect many will rightly consider it a very compelling tick in the Live Suite box. This whole update is shaping up to be the most significant since Ableton enabled support of third-party audio plugins, way back in version 3. Without exception, everything we've seen so far makes Live 9 an even more compelling proposition than Live 8 is already, and reasserts its position as one of the most forward-thinking, original and powerful music-making tools on the market. Whether it's the editing refinements of a maturing DAW, the revolutionary functionality of one-click Audio To MIDI, or the pro-enticing tweaks to the effects, this release looks likely to capture the imagination of Live's existing user base and set the cat amongst the pigeons in the increasingly competitive and innovative DAW marketplace. Ableton Live 9 is released March 5, we'll be bringing you a full review and plenty of tutorial content very soon!